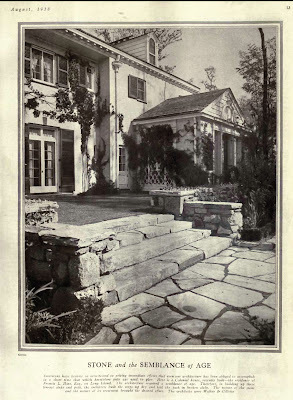 A 1918 House & Garden spread on 'Mayhasit', the Francis Lyman Hine estate designed by Walker & Gillette c. 1915 in Glen Cove. Click HERE for more on 'Mayhasit'. Pictures courtesy of The Down East Dilettante. Thank you Zach and 'The Down East Dilettante.' I absolutely love 'Mayhasit' in its original condition. 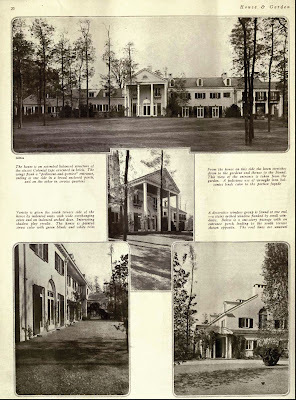 Walker & Gillette successfully designed a very large house that actually seems charming and comfortable because of the wonderful details and the way they broke each facade into individual elements with separate gardens. The interiors are also very fine. 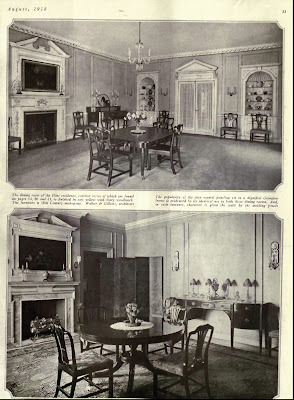 Although the rooms appear quite large, the woodwork and 'molding panels' gives them a charm that I find very appealing. Such a shame that it is still standing in such a compromised state today. this house has so many unique details. those end wall chimneys built into the roof line with those big palladian windows right below them. man, what a great detail. 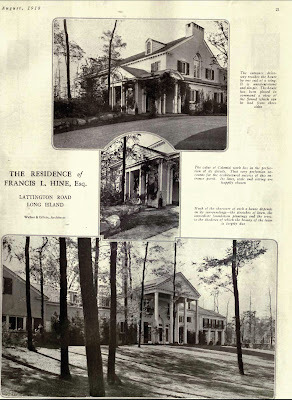 but they must have radically altered the house as the big chimney that shows behind the columns is gone. it certainly is a big house and serpentine. not courtyards but more cul-de-sacs. still, i'd have to disagree with the previous comment. its good its still extant. i think the colony in this colonial must be virginia or south carolina. them big porches would gather too much snow up here in the north country (at least when this was built). do we know what the inside looks like now?